Eating on a ship is an appealing prospect, but for those of us without the benefit of ‘sea-legs’ there is a problem. It is called ‘movement’. I can begin to feel queasy at the sight of a goldfish bowl, so the idea of trying to down the minestrone as the table lurches this way and that is not for me. The solution is to find a boat (or a passing imitation of one) on dry land. A caravel was a light, fast ship in the days of sail. 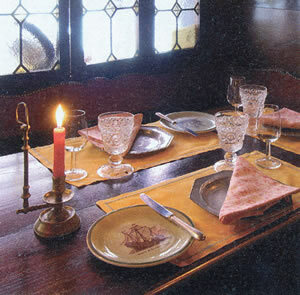 In its Italian version, La Caravella is the dining room of the Hotel Saturnia in Venice. And a handsome room it is, even for this landlubber, with its ship’s wheel, ropes, hooks, lamps, chains and abundance of dark wood. It is also an excellent restaurant. 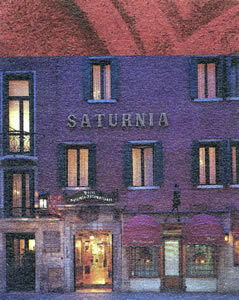 The Hotel Saturnia enjoys a convenient location, close to La Fenice, the opera house, and not far from St Mark’s Square. I have often walked past its building and noticed the model ship which hangs in one of the ground floor windows. My expectation that its restaurant would be busy was fulfilled when I went for dinner. 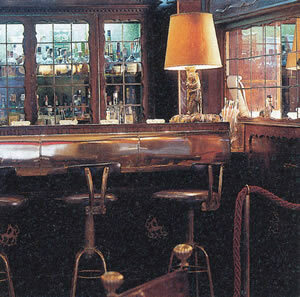 The wooden tables of this small, dark, intimate room were filled with animated diners. (And animated diners are usually happy diners.) The red candles flickered and the waiters, wearing white bow ties, rushed hither and thither with plates of food. On the evening of my visit, in the absence of maitre d’ Nicola Celegato, sommelier Claudio Toffoletto looked after me. 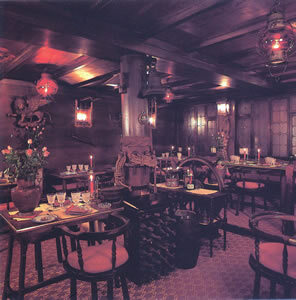 This hotel has been owned by the same Venetian family for over a century, but its restaurant was not opened until the early 1960s – at which time the designer Luigi Orefice was brought in to create a room which would suggest the interior of an ancient sailing ship. He did a good job. All that was missing was the movement. I was happy. I was happy, too, with the food which came from the kitchen of Chef Silvano Urban. It is Italian food, of course, and it is served in large portions. It is also based upon fine ingredients and speaks of traditional culinary methods. 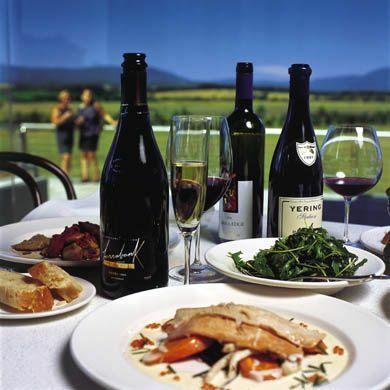 The cuisine is therefore straightforward and highly enjoyable. It is a pity that, because the table space is limited, the plates are quite small and can therefore look a little crowded – for this food deserves a more expansive presentation. Still, we should not complain – space on a ship is always limited. I began with lobster and grapefruit – the flesh sweet and tender, and admirably balanced by the asperity of the fruit. Next, I tucked into a crowded plate of potato ravioli with taleggio cheese. I could not give this top marks for appearance, but the flavours and textures were certainly satisfying. 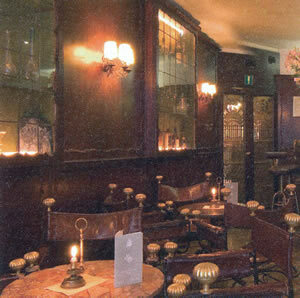 Venice has no cellars and therefore wine lists in the city tend to be shorter than those in other places. The list at La Caravella, with around 220 offerings, is surely one of the longest. Prices range from 25€ for a pinot grigio from the Veneto to 2,600€ for the 1964 Biondi Santi Brunello di Montalcino. Other bottles to catch my eye were: Cristal champagne 2002 (280€), Planeta chardonnay 2007 (65 ), 1967 Richebourg DRC (995€), Ornellaia 2003 (450€), 2005 Solaia (420€) and 2006 Sassicaia (500€). Both my bottles were local. The white was light and easy on the palate, with hints of sherbet (Incrocio Manzoni, Masottina, 2009 - 29€). The red was luscious, full-bodied and full of ripe black fruit (Valpolicella Classico Superiore, I Progni, Salette, 2007 - 45€). It made a superb partner for the beef. I commend La Caravella to you. Its nautical qualities stop short of movement, and it will give you a satisfying dinner. 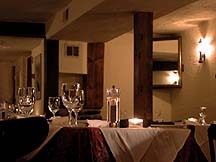 Hotel Saturnia, Via XXII Marzo 2399, Venice 30124, Italy.